Two prophetic words have been released recently from very well-known, reliable prophets. These are radical, spirit-inspiring words that are so important, I’m dedicating an entire blog post to them here and asking you to read them. 1. The first is from Doug Addison. It’s called Prophetic Word: Time For a Sudden Turnaround. This is the word God gave Doug Addison for the month of December 2014. It also shares quite a bit about what God is going to do in 2015. If you aren’t familiar with Doug Addison’s ministry, he is known for prophetic evangelism and dream interpretation. He also carries the anointing of the sons of Issachar and can discern God’s times and seasons. Everything I’ve ever read from him has been dead-on accurate in my life. You’ll enjoy his ministry and I’d encourage you to follow him on social media too. 2. The second word is from Bill Yount on the Elijah List. This word is called “Being Hidden: The Makings of a Spiritual Sniper.” If you have ever felt hidden or like nobody knows you, READ THIS! 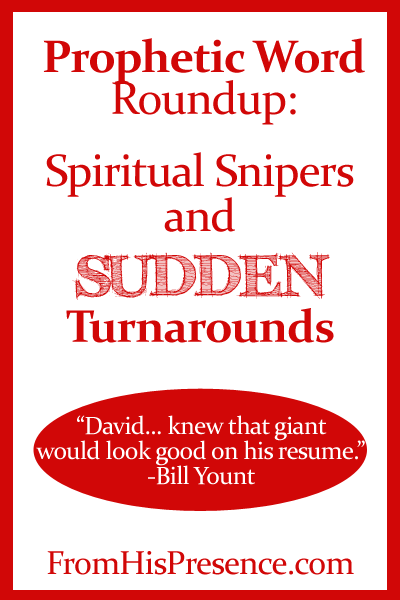 Maybe, just maybe, you’re a spiritual sniper! Maybe you’re called to move stealthily and powerfully in the spiritual night, flying under the radar to accomplish God’s Kingdom purposes. This word is going to bless somebody today. This word read my proverbial mail. It’s exactly what I feel God is doing in my life right now, and what He has been doing for a number of years. So again, please RUN, don’t walk, to read it.